Polish Shabbethaian; lived at Zolkiev in the first half of the eighteenth century. An excellent Talmudist, and possessing in the highest degree the art of dissimulation, he was sent by the Polish Shabbethaians as a secret emissary to Moravia, Bohemia, and Germany, to establish relations with their sympathizers in those countries. Kamanker visited Prague—where he associated with Jonathan Eybeschütz—and many other communities, endeavoring everywhere to spread secretly Shabbethaian writings, and probably also to collect money for the leaders of the sect. His mission came to an abrupt end in Frankfort-on-the-Main. 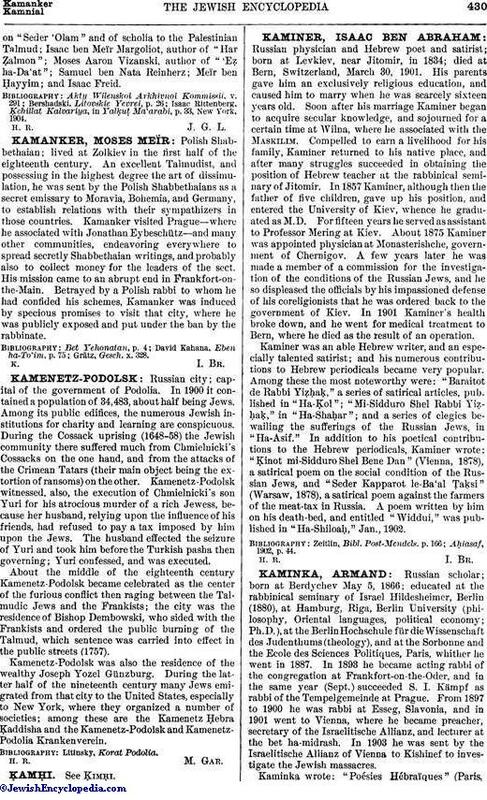 Betrayed by a Polish rabbi to whom he had confided his schemes, Kamanker was induced by specious promises to visit that city, where he was publicly exposed and put under the ban by the rabbinate.